PATILAD Moringa Farm is a budding farm that is involved in cultivation of the miracle-moringa plant for local and foreign markets. We cultivate, preserve, package and sell moringa leaves, seeds, oil and barks of the Moringa oleifera and Moringa stenopetala species. 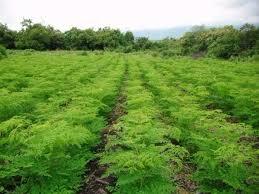 Our farm is sited on a 50 hectares arable land dedicated for Moringa alone. we have capacity to produce over 10,000 tons of bags of this seed annually, with its other by-products. We cultivate, process and package to meet requirements of the standard organization of Nigeria as well as NAFDAC. We are targeting consumers in both the local and international markets. Executive summary of Moringa Farming Business Plan in Nigeria. PATILAD Moringa Farm is established as a limited liability company owned by Dayo Adetiloye, Arowolo Isaac, and other investors. The farm is managed and directed by Dayo Adetiloye, a veteran in the Agric. industry with 8 years’ experience and Arowolo Isaac an experienced Agro-allied specialist with over 15 years’ experience. Our company is being founded to build upon an extensive array of biological and horticultural education, experience and the research of its founders. Patilad Moringa Farm is located at Ikase, Kwara State. Our vision is to develop sustainable operational system for our farm that makes our company among the fortune 500s in Africa. To supply our customers the best of moringa products of the highest quality standard. To provide cutting edge products and services at the most reasonable rates possible. To reach the point of sustainable profitability in the next 5 years. To maintain profit margins at 20-25% through close attention to expenses and cost of Moringa production. To extend our nature of business approach to the manufacturing and production industry, especially those related to ours. To become a leading supplier of moringas in the industry. To achieve break-even in the 3rd year. Distributing up to 10 tonnes in 3 years on domestic and international markets. Ensuring that all customer’s needs are met and they are satisfied with the purchased products. PATILAD Moringa Farm will basically sell healthy disease free and highly medicinal moringas. We process our moringas into dried leaf powder for human and animal consumption, oil for human consumption and bio-fuel and leaf, twigs and press cake as animal fodder and moringa tea. We are concerned about providing Moringas products that meets for domestic and industrial purposes. We produce and sell high quality, well packaged, hygienic and fresh products in large commercial volume and best possible prices. Moringa looks set to become one of the fastest growing cash crops coming out of the African continent as world food prices soar and the global nutritional recession begins to take hold. Moringa roots have high demand in national and international markets due to its excellent uses and benefits. Since the introduction of Moringa, the price has been on 50 per cent increase annually because of new research and development of the usefulness. Between 2015 to 2016, the price jumped from N50 per kg, which is N500, 000 per ton to 200 per kg, which is 2 million per ton. So far, very few farmers are in to commercial Moringa farming which makes it almost impossible to cater for its high market demand. Competitors for PATILAD Moringa Farm are mainly small holder farms located in and around Ogun state. PATILAD Farm’s competitive edge includes the use of modern production techniques and equipment which turns out high quality products, excellent customer service, the expertise of its founders, etc. I have over 10 years’ experience in the Moringa cultivation, processing and sales business and I have B. Agric from Obafemi Awolowo University Ile-Ife. I also have a master’s degree in business administration MBA from same school. I am in charge of strategy planning for the business. I have over 7 years’ experience in this business and numerous exposure to both the scientific and business of moringa, I’ve been able to master the technical requirements, staff recruitment and organizational skills. My managerial skills have also helped in putting together a workforce for over 5 years, which will help me to coordinate the team work in most aspect of the company. PATILAD Moringa Farm seeks N5 million in long-term financing to cover start-up costs, equipment, building expenses, and working capital.